NEW VIDEO BLOG: Marketing Products Exposed!!! Posted on 16. Jun, 2009 by Kaiser. Posted on 04. Jun, 2009 by Kaiser. It will based on all of the feedback I've been getting from you about what your real needs and interests are. It's going to have some great services you're going to love that will help you get to your goals more quickly and affordably - they won't make me much money, but they will help you make serious progress in your fitness career. In terms of an expected date of launch, I haven't really set one yet - I've been doing a little bit every day with my designers and programmers and it should be ready soon. Whenever we want results at something, we all tend to try to reinvent the wheel, but that's a mistake ..
Fast Track To Fitness Millions Update from Jersey! Posted on 30. May, 2009 by Kaiser. The first thing I've got say is how well run and polished this thing was - you'd hardly believe it was the first big event to be put on by fitness business experts Pat Rigsby, Nick Berry, and Jim Labadie. And secondly, they attracted a tremendous crowd of nearly 300 personal trainers, bootcamp instructors, and fitness marketing entrepreneurs. It was a sharp bunch of heavy hitters looking to do serious damage in this industry. Lastly, what stands out is the incredible line-up of speakers. The full gamut of topics on how exactly to succeed in fitness today (not 20 years ago) was covered from top to bottom. The best part, for me was getting to meet up with all of the other industry people. We're spread out all over the country, so these events are really the only time for all of us to meet face-to-face - that's what makes them so fantastic. Where’s a Top-Level Trainer When You Need One!?!? Posted on 28. May, 2009 by 7Figure Sam. It's about time someone put a stop to the madness. I'm talking about recall of 3,000,000 fitness balls. The truth is, this piece of "equipment" can be extremely dangerous if it falls into the wrong hands. 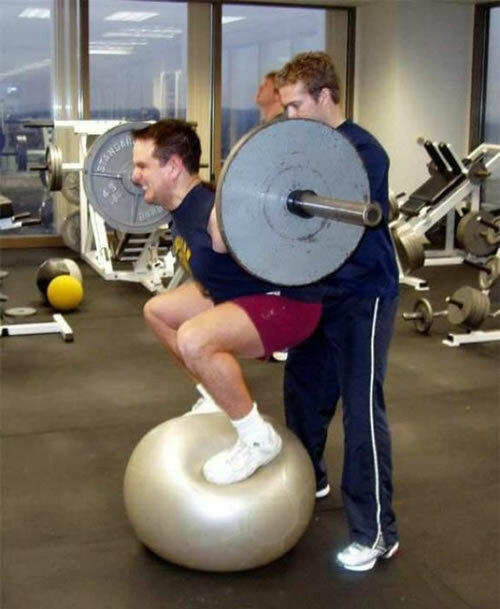 It doesn't take a CSCS to tell you that anything involving a barbell, one or more 45 plates, and a stability ball is probably not a good idea. Design Service Is a Hit! Posted on 26. May, 2009 by Kaiser. Well it's official - the Super-Trainer Design Service is a huge hit! So far, every trainer that's purchased one or more designs has been amazed at how professional and attractive their logos and website headers look. A lot of trainers are even coming back with more orders for Ebook covers and custom labels, which have turned out great as well. I'm starting to get a flood of orders coming in, and I'm not sure how long I'll be offering this service at such a cheap price, so if you're looking to get this part of your business handled right away, then head over to fitness design services page and get your order in.